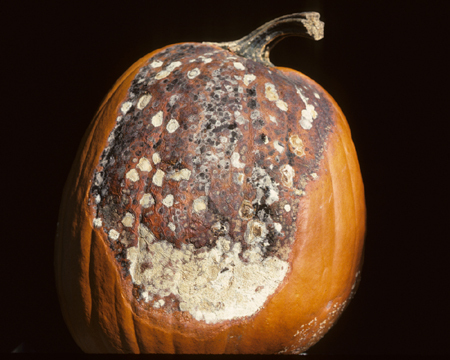 Alternria cucumerina is most common on melons and watermelons, although it can affect most cucurbit crops. It is prevalent in regions with abundant rainfall and high temperatures. In the picture above, A. cucumerina is probably secondary to Fusarium infection and occurs as a dark-green to black mold. Lesions are most often seen on leaves, but fruit spots have been reported. Symptoms first appear on older leaves near the crown. Initially yellow brown and small with a green to yellow halo, lesions expand into large, brown necrotic areas. 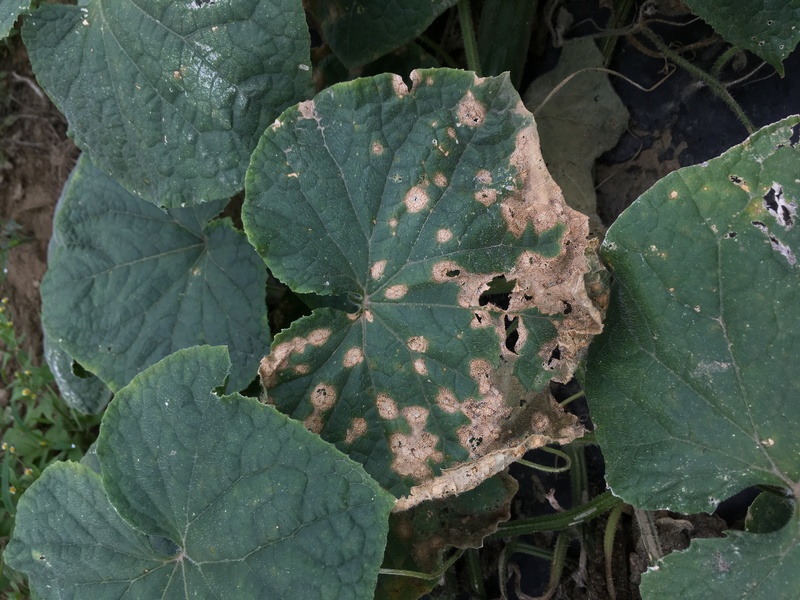 Lesions show the concentric rings that are characteristic of Alternaria infections. A. cucumerina can survive for up to two years in diseased plant debris. The source of the disease is considered to be dormant mycelium in cucurbit fields and airborne conidia. Conidia spread by wind and rain splash produce secondary cycles of infection whenever conditions are favorable for disease development. Disease severity increases with periods of leaf wetness. Lesions can coalesce and the leaves develop a cupped appearance and die. Defoliation exposes the fruit to sunscald which reduces fruit quality. Rotate with non-host crops for at least two years. Remove or deep plow plant debris to speed decomposition. Maximize the distance between cucurbit fields to limit spread. Avoid overhead irrigation, if possible. For Current information on disease recommendations ins specific crops including information on chemical control & pesticide management, please visit the New England Vegetable Management Guide website.